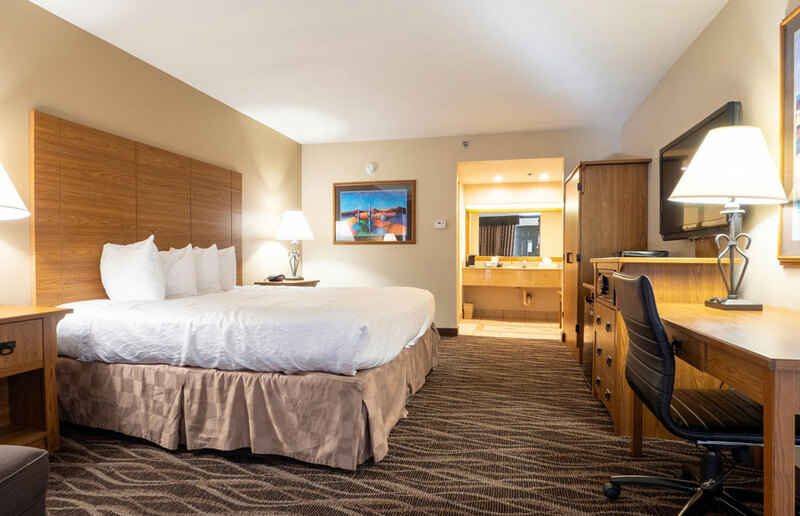 The Best Western Plus Saddleback Inn and Conference Center is proud to offer 220 rooms and suites tastefully appointed with sophisticated southwest decor. We have recently completed a $2 million renovation to bring all our Oklahoma City suites and rooms up to the highest standards. Indulge in our new Serta luxury bedding featuring tone-on-tone sheeting, bolster and large sham pillows. Each guestroom and suite features a microwave/refrigerator unit, cable television with HBO®, and many pampering amenities and features. Our business guests will also appreciate our well-lit ergonomic work desks and complimentary access to high-speed Internet. At the Saddleback Inn, you will receive a complimentary hot breakfast buffet each morning. For additional information on our hotel features and services, please view our Hotel Amenities page. Featuring 1 king bed, these spacious rooms are perfect for an overnight stay for couples, smaller families or a single traveler on business. A wide variety of value-added amenities such as a microwave, refrigerator, and coffee maker are included. Featuring two Queen beds, these spacious rooms are perfect for an overnight stay for couples, smaller families or a single traveler on business. A wide variety of value-added amenities such as a microwave, refrigerator, and coffee maker are included. Enjoy the additional privacy of having a separate bedroom in an Executive King Suite. Ideal for larger families, groups, two travelers, or business executives, these suites feature a king bed, iron, full size ironing board, hair dryer, work desk, fridge, microwave, CD clock radio, and entertainment unit. Every Suite now features two 42” LCD TVs, one in the bedroom and one in the living area. In addition, each suite also features a queen size pull out sofa bed in the living area. Enjoy the additional privacy of having a separate bedroom in an Executive Double Queen Suite. Ideal for larger families, groups, two travelers, or business executives, these suites feature two queen beds, iron, full size ironing board, hair dryer, work desk, fridge, microwave, CD clock radio, and entertainment unit. Every Suite now features two 42” LCD TVs, one in the bedroom and one in the living area. In addition, each suite also features a queen size pull out sofa bed in the living area. For your comfort and safety this room is equipped with additional disability accessible features including a roll-in shower, raised toilet with grab bars, shower safety bar, bathroom rails, knock lights and closed caption TV. For your comfort and safety this room is equipped with additional disability accessible features including an accessible bath tub, raised toilet with grab bars, shower safety bar, bathroom rails, knock lights and closed caption TV.